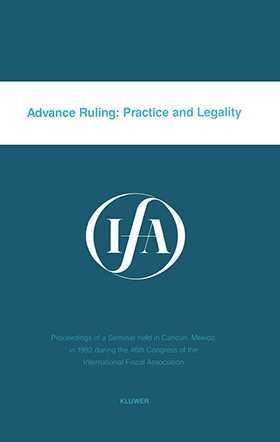 This edition in the IFA Seminar Series contains the lectures of a seminar held in Cancun, Mexico in 1992 during the 46th Congress of the International Fiscal Association on the theory and practice of advance ruling in the fiscal sphere. Advance ruling may be defined as `a decision regarding the consequences of a proposed transaction, given by the competent authority and binding upon that authority'. The subject, applied to the field of taxation, is regarded by authors from the perspectives of France, Germany, The Netherlands, Sweden and the USA. Despite the differences existing in the USA, France, The Netherlan ds, Germany and Sweden with regard to advance ruling in tax matters, a few general characteristics can be given. In all the countries in question the taxpayer does not, in all cases, have a right to an Advance Ruling, but in case he does obtain one, it is binding upon the tax authorities. The taxpayer in all the countries concerned can renounce the right to rely on an Advance Ruling.